Saved By Grace is a husband and wife team in Dallas dedicated to stirring up the faith among Christian brothers and sisters, as well as reaching the lost with the good news of Jesus Christ through Southern Gospel music and the preaching of God's Word. Darrell and Dina are dedicated, faithful servants of the Lord Jesus Christ and believe in being obedient to the calling placed on their lives. Saved By Grace ministry was formed in 2011 with a vision to minister through Southern Gospel music and the spreading of the Word through Old Fashioned Preaching. 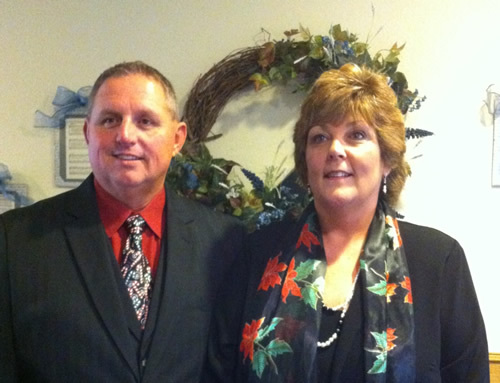 Our plans are not always God's plans, and in 2012, Darrell and Dina followed the Lord's direction in answering the call to pastor a church in the area. In 2015, they embarked in a new direction with a group of believers at New Life Baptist Church in Crandall, Texas, under the guidance and leadership of the Holy Spirit. Saved By Grace welcomes any opportunity to serve the Lord and is available to sing and/or preach anywhere God opens the door.